The health benefits of eating less processed, less refined foods are well documented. However, preparing whole foods wasn’t always the easiest or best-tasting choice, but owning a Vitamix machine changes all that forever. A Vitamix Total Nutrition Centre® makes it quick and easy to eat whole foods in one great-tasting recipe after another. Plus, its impressive power from the commercial-quality motor, laser-cut stainless-steel blade design and precision-designed container makes light work of tearing down the cell walls of fruits and vegetables, making vital nutrients more readily available for your body to absorb. With a Vitamix machine, even the nutrient-packed peels, pulp and seeds can be pulverised and blended into recipes for some of the most health-protecting, disease-preventing dishes and drinks…. Surprising food combinations that produce incredible flavors are suddenly possible with a Vitamix Total Nutrition Centre® in your kitchen. A vast, fresh array of tastes from super-charged whole foods is at your disposal, and every meal is another exciting opportunity to try something new, delicious and nutritious. The Vitamix Total Nutrition Centre® can do the work of 10 kitchen appliances and lets you perform more than 50 kitchen tasks easier, faster and with better results than you can achieve any other way. • Dice, chop or blend ingredients into healthy, preservative-free salsas, dips and more. Whether you want to elevate your expertise and creativity in the kitchen, or you’re just searching for a simple way to feed your family more nutritious meals, the Vitamix machine is an unbeatable value. From breakfast to dinner and from appetizers to desserts, it will become one of the most indispensible kitchen tools you’ve ever owned. With a Vitamix Total Nutrition Centre®, you’ll soon be experiencing a whole new world of flavour, nutrition and creativity. 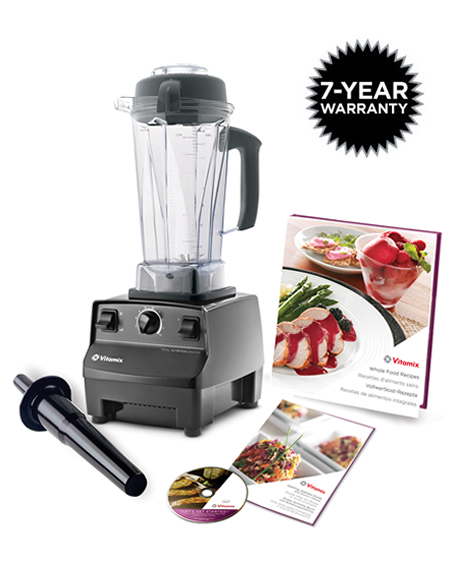 The Vitamix Total Nutrition Centre® is backed by a 7 year warranty and comes with a Getting Started DVD, Getting Started Guide Manual and a Whole Foods Cookbook making it easy to start improving your life straight away. Your Vitamix® machine is much more than simply a blender or juicer. Its powerful motor can handle even the toughest of foods, allowing you to make super smooth, whole food juice packed with vitamins, minerals and other nutrients. Research shows that phytonutrients and antioxidants in whole foods can significantly reduce damage to the cells by free radicals. The hard part is getting these essential chemicals into a digestible form as they’re locked inside skin, pulp and seeds. The Vitamix® machine can rupture the cell walls of fresh, whole foods to deliver the full benefit of nutrients. We’ve invested a significant amount of time and energy into the technology behind the Vitamix® machine – and we’re confident that it’s the best kitchen appliance out there. Forget buying different contraptions to blend, juice, mix and pulp – the Vitamix® machine does it all! Freshly made juices are not only delicious; they include a variety of nutrients enabling even the fussiest eaters to get the health benefits of fruits and vegetables. 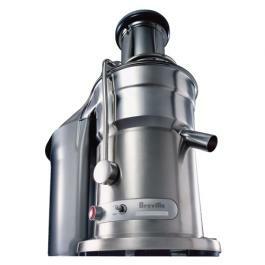 The Antony Worrall Thompson by Breville Professional Juicer extracts juice from both hard and soft fruits, effortlessly allowing you to create refreshing drinks to serve over crushed ice; fruity cocktails; winter beverages to warm with spices; or to kick start your health routine. There is no need to chop and remove the seeds as the powerful motor with its two speeds and the pulp filter means only the fruit juice is in the jug ready to drink. Easily removable parts make it simple to clean too! “With my juicer there’s no need to chop fruit, it can even take whole apples, so with no need for sharp knives you can help the kids have a go!” (Anthony Warrell Thomopson). 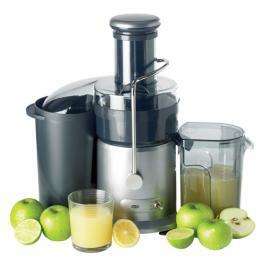 From its superbly crafted powerful 1200watt motor, right through to its commercially styled casing, this deluxe Breville Juicer successfully combines power, innovation, durability and performance for the ultimate in juicing. Advanced features such as a patented extra wide feed chute that takes whole fruits and vegetables, large capacity pulp container and efficient stainless steel micro mesh filter, all make preparing juices that much easier. Other features include: A two-speed control (low for soft fruits; high for harder fruits/vegetables); a Food Pusher; a Juicer Cover; a Stainless Steel Micro Mesh Filter Basket; Filter Bowl Surround; Large Pulp Container with handle; a 1 litre Juice Jug; a Safety Locking Arm – the juicer will not operate without the juicer cover in place and safety locking arm in place in the vertical operating position; on/off switch; and cord storage facility. This stylish Juicer is not only guaranteed to make juicing faster, but its design also makes it one of the easiest to clean. With fewer parts and smooth rounded surfaces, all removable parts can be quickly and easily rinsed in hot soapy water after use and the motor base wiped clean with a damp cloth.